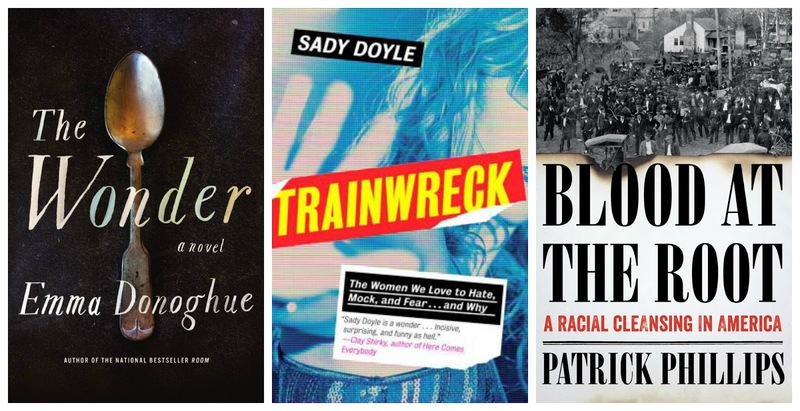 August has come and gone, and with it a lackluster month of reading. 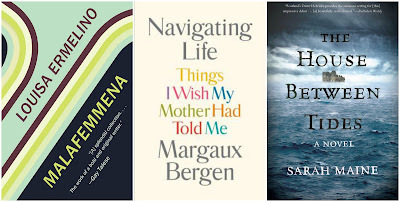 Though looking back, I did finish six books this month, it felt slow and disjointed. Which is not to say there was anything wrong with the books themselves, which were actually quite excellent. Malafemmena, by Louisa Ermelino: This collection of short stories plays on the story of the "malafemmena." Though the word translates roughly to "bad woman," Ermelino's women are not bad so much as they are non-traditional, traveling, single, fleeing, independent, rebellious. The stories are slight but impactful--a quick read for anyone interested in short story collections. Reviewed in Shelf Awareness for Readers. The House Between Tides, by Sarah Maine: Maine's debut proves an atmospheric mystery that alternates between past and present, as a young woman explores the mansion she's just inherited on Scotland' Outer Hebrides. I was admittedly more pulled into this story than I'd first expected to be; I read it in almost one sitting and didn't regret a single moment spent in its pages. Reviewed in Shelf Awareness for Readers. 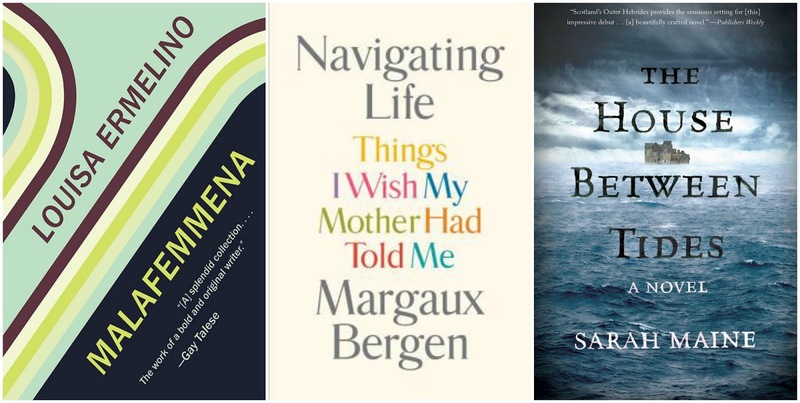 Navigating Life: Things I Wish My Mother Had Told Me, by Margaux Bergen: Bergen's book is written as a series of life advice to her college-bound daughter, but her words are applicable to any reader. This book resonated with me--and with When Women Were Birds, which I'd read just prior to picking it up--in ways I'm still figuring out. Reviewed in Shelf Awareness for Readers, and written about in conjunction with When Women Were Birds here. ... and some old books. Shelter, by Jung Yun: I started Yun's novel after starting and setting aside several other e-books on a plane ride this month, and ended up reading the entire book on one flight. Shelter is the kind of novel full of dysfunctional family drama that feels like a trainwreck from page one, but the kind of trainwreck that makes it impossible to look away. So, so excellently done. 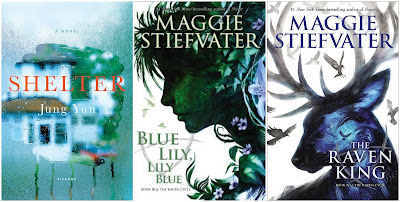 Blue Lily, Lily Blue and The Raven King, by Maggie Stiefvater: I loved (love-love-loved) The Raven Boys, the first in Stiefvater's series of the same name, and really enjoyed the second in the series, The Dream Thieves. Blue Lily, Lily Blue and The Raven King merge together a bit in my head because I listened to them back-to-back; together, they were not my favorite of the series, but proved a satisfying conclusion to the story of four teenagers (or maybe five) seeking the buried body of an ancient Welch king and maybe accidentally waking some magic forces in Virginia along the way. The New Jim Crow, by Michelle Alexander: Our August pick for the Social Justice Book Club was enlightening and eye-opening and thought-provoking, and everything I hope books for this club can be. 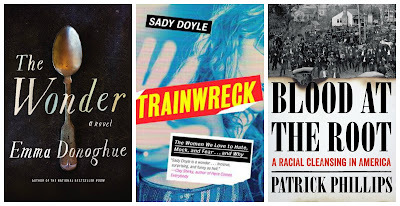 Come join the discussion (and see my review of The New Jim Crow). To be honest, this month was such a flurry that I barely cracked open my Feedly reader (sorry, fellow blogging friends!) and didn't bookmark a single thing. So instead of sharing my favorite things from the interwebs in August, I want to know what I missed: what were your favorite things online this month? ?